This page describes what I did to run Linux on the Webpal. Hardware facts. This is what I know about the hardware. Bootstrap procedure using serial port and GDB. Another bootstrap procedure using an ERX file downloaded over the net. Adding an RTC to the Webpal. 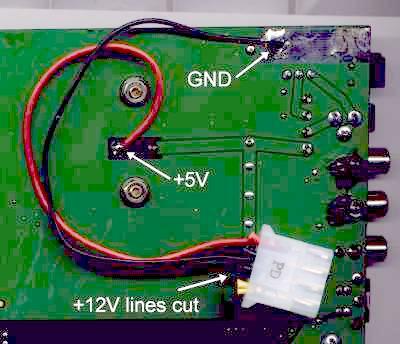 Better reset circuit. This enables the Webpal to reset reliably during short power glitches. There are two version of flash SIMM on the Webpal, a 1MB flash (512K x 16) and a 2MB flash (512K x 32). It's easy to tell the difference: the 1MB flash SIMM has only a single flash chip while the 2MB flash has two flash chips. Most Webpals came with the 1MB flash. Some 2MB systems are now showing up or with a careful hand, one can add a second flash chip to a 1MB SIMM to turn it into a 2MB flash SIMM. I've done this myself by removing the flash chip from one SIMM board and adding it to a second SIMM board. I use the ChipQuik® SMD removal kit #SMD1 to help make it possible to remove the SIMM chip without damaging it. This kit contains two very useful items, flux in a syringe and very low temperature solder. The kit costs between $15-$20. I bought mine at Digikey but I've seen it at Fry's stores in the San Francisco Bay area. root partition can be moved. This gives the ability to adjust the sizes of the zImage (kernel) and root partitions to meet a particular application's needs. For example, one might want a larger kernel and use NFS for the root partition. In this case, the root partition start could be set to zero and the zImage partition would then be 992K. As you can see, there is not much room to store a reasonably useful root partition on the 1MB flash. For a 1MB flash system, most people either mount root via NFS or install some sort of IDE device as described below. For 2MB flash systems, there is the possiblility of using the Webpal with only the onboard flash since the root partition is now over 1MB. The bootstrap loader partition contains the bootstrap loader. This is the program that runs when the system is reset or powered on. It initializes the the hardware, copies the Linux kernel from the zImage partition into memory, and branches to it. The bootstrap loader also contains a flash programmer that can reprogram any of the partitions. The parameters partition contains parameters for the bootstrap loader. This partition consists of zero or more keyword=value parameter lines. The end of the parameters lines is marked with a null line (at least two NLs in a row). The parameters are described below. The zImage partition contains the kernel zImage. The bootstrap loader copies this into RAM and then branches to it. The root partition contains space for a root partition. If the kernel parameters specify root is /dev/mtdblock3, this partition must contain the root filesystem image. Because of space issues, this will probably be a cramfs image. Using a cramfs image for root is allowed in this case since the kernel image does not reside on the root partition. If you are not using the root partition, it is possible to tell the bootstrap loader and programmer to use part or all of its space for a larger zImage partition. The bootstrap loader initializes the Webpal, copies the zImage from flash into RAM, and branches to it. Status messages are output to either the video interface or serial port. V3.3 supports both 1MB (16 bit wide) and 2MB (32 bit wide) flash. A new wpflash program is required when using V3.x for flash programming. The new wpflash program supports both V3.x or V2.x for flash programming. By default, bootstrap messages are output to the VGA port and the parallel port is used to connect to a Linux system for flash programming. If you wish to build a serial interface, you can use the serial port for both bootstrap messages and flash programming. This is done using the serialbootp parameter as described in the parameters section. Holding down the SW2 button inside the Webpal while resetting will cause the bootstrap to use the alternate device(s) used for output/programming. For example, if normallythe serial port was used, holding down the SW2 button during reset would cause the webpal to use the video and parallel ports instead. The bootstrap loader contains a flash programmer that can erase, program, and read any of the partitions on the flash. 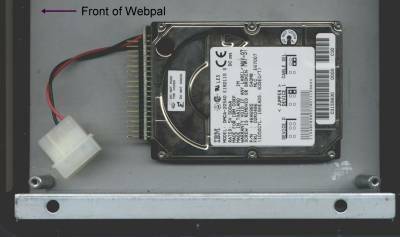 A program called wpflash runs on another Linux system and communicates with the flash programmer via either the Webpal's serial or parallel port. Use of the serial port requires the construction of the RS-232-C level adapter described elsewhere on this page. Use of the parallel port requires a parallel Laplink cable which you can purchase at your local computer store. Use of the parallel port also requires that your Linux system contains the parport driver, a driver that allows user level access to the low level parallel port routines in the kernel. The bootstrap loader can detect both known versions of the Webpal CPU board and whether a 16 bit or 32 bit flash SIMM has been installed. This information is displayed as the system boots. If you program a 32 bit flash SIMM as a 16 bit flash, the bootstrap loader will still work. However, if you then program the flash using the bootstrap loader, its will reprogram the flash in 32 bit mode. This provides a method of bootstrapping 32 bit systems. First, bring the bootstrap up as though the flash were 16 bits wide. Then, use the onboard programmer to reprogram it in 32 bit mode. If value is 1, bootstrap messages are sent to the serial port and the serial port is used for the flash programming. If value is 0 or this parameter is not specificed, bootstrap messages are sent to the VGA screen and the parallel port is used for flash programming. Holding down SW2 inside the Webpal while resetting will change negate the serialbootp value. Defines the IDE parameters passed to the kernel (example: ide=0x170,0x376,11 ). Generally, this parameter is not needed as the bootstrap loader will automatically configure the IDE interface to match the IDE parameters in the Linux Webpal port. The root file system is mounted readonly. Otherwise, the root file system is mounted read/write. 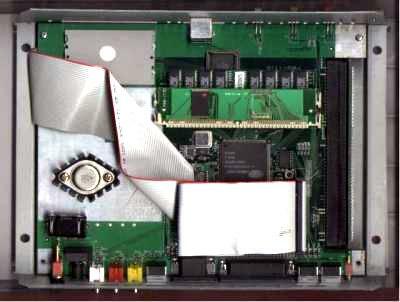 TV output is disabled, saving power and allowing the Webpal to run much cooler. This is recommended unless you are using the TV outputs. Note that setting tvoff does NOT disable the VGA outputs. This option is required if you plan on using the IO pins for the RTC mod. Specifies a new hexadecimal value for the starting offset of the root partition. Since the zImage partition immediately precedes the root partition, this value also specifies the end of the zImage partition. A value of zero means no root partition and the entire root partition space is added to the zImage partition. The value must make a sector address in the flash. This means that the address must be divisable by 0x10000 for a 1MB flash or 0x20000 for a 2MB flash. During programming, the wpflash program read this parameter from the flash before programming and will take its setting into account when calculating a partition start and stop. In addition, the bootp program passes all the partition information to the kernel using the 'Compaq' format. If this option (Compaq bootldr partition table parsing in the Memeory Technology Devices (MTD) section) is specied during kernel configuration, then the kernel will correctly determine the starting offsets for the partitions. Here are the pointers to the source code and a compiled binary of the bootstrap loader. As an aid to getting started, I can program your flash with the bootstrap loader if you mail me your flash chip with return postage. Please contact me at the email address below for more information. To initially program the bootstrap loader into flash, I built a standalone flash programmer. Both this standalone programmer and the programmer in the bootstrap communicate with a Linux system via either the serial or parallel port. The program running on the Linux system is called wpflash. -p use parallel port (requires user space parallel port control via /dev/parport0). Start wpflash first and then press the reset button on the Webpal and programming should commence. If you have problems synchronizing (this generally happen only in the parallel port mode), hold down the reset button, start the wpflash command, and then release the reset button. Here is a toolchain that can be used to build kernels on x86 linux systems. The kernel patches are relative to the rmk patches on the ARM Linux site. Apply these patches after you have applied the appropriate version of the rmk patches to the base kernel vesion. The current Webpal patch is relative to: Linux-2.4.18 and 2.4.18-rmk4 . Includes NFS client device driver and ethernet driver. Can be set up to boot root from an NFS volume. Console is VGA output / PS-2 or IR keyboard. No IDE driver. Check out the config file for more details. Compaq bootldr partition table parsing under Memeory Technology Devices (MTD): this option should be enabled so that the kernel can correctly determine the partition starting offsets. The bootstrap loader passes the partition offsets to the kernel in this format. Plug and Play support and ISA Plug and Play support under Plug and Play configuration: these options should be enabled if you are using an ISA PNP ethernet card so that the card will be correctly configured by the kernel. If you do not enable these options, then you must manual configure you ethernet card to enable it in non-PNP mode. Webpal IR keyboard support under Frame-buffer support / Console drivers: this option should be enabled if you wish to use the IR keyboard. If you do not enable this option, then you will have only the PS2 keyboard port and the serial port coming from the 805x microprocessor will be instead accessable via /dev/ttyS1. This is useful for debugging the IR keyboard keycodes or for applications where the 805x microprocessor to perform other functions. use the built-in IDE interface and hook up a Compact Flash or 2.5 inch IDE drive using an adapter. get everything to fit in the 384K available on the root partition on the onboard flash. The Debian ARM distribution is a good source of precompiled binaries for building your root partition, either NFS or on an IDE device. Of course, the usual popular embedded Linux packages like busybox and uClib can be used by compiling them for the ARM processor. Here is a source of some binaries and source files. I generally use a Compact Flash via an IDE to Compact Flash Adapter. I mounted the adapter under the main Webpal PC board on the bottom metal cover and then cut a slot in either the front or back panel so I can insert a Compact Flash card. Here is a picture showing the back panel version. Due to a bug in the Webpal hardware, you need to pin that needs to be lifted to make the IDE interface work. To use the root partition on the onboard flash, your root image must fit in 384K with a 1MB system. This means probably only a few applications and maybe busybox. I've replaced the serial modem with an NE2000-clone ethernet card. Due to restrictions in the ISA bus interface on the Webpal, experience has shown that only ISA ethernet boards based on the Realtek 8019(AS) chip seem to work. An example of such a card is the Kingston KNE20T. The current kernel supports ISA PNP if enabled during kernel configuration. This allows you to use the ISA PNP ethernet cards without having to set the card to non-PNP using its DOS utility. If you wish to run a kernel without ISA PNP enabled, then you will need to set the ethernet card to 0x300 and make sure it is set to use IRQ3 since that's the only interrupt line wired to the ISA bus slot. This maps to interrupt #9 in ARM linux. The ne driver should work either compiled into the kernel or as a loadable module. I built a RS-232-C serial port adapter to use the sytem without a display in various server applications. Be sure to cut JP1. If you don't, the IR receiver is also connected to this RS-232-C port and can cause garbage characters on the serial port. The current kernel patches support both the PS2 keyboard port or the IR keyboard. There is a configuration option in the video driver section to enable/disable the IR keyboard. If the IR keyboard is disabled, the serial path used by the IR keyboard appears as /dev/ttyS1. This is useful if you wish to reprogram the AT89C52 for other purposes. Based on my initial disassembly of the code in the AT89C52, it doesn't appear there is any smart card support. As supplied, the AT89C52 decodes IR keyboard input and sends it on a serial port to Linux. Normally, this data goes to a keyboard driver in Linux. However, if the IR keyboard is disabled, the serial port data from the AT89C52 appears to Linux as /dev/ttyS1. I use this option when I want to reprogram the AT89C52 microprocessor to do other things. For example, I've reprogrammed the AT89C52 to decode wireless weather station signals from a small receiver and send the results via the serial port to the Webpal. The application on Linux simply reads the data by opening /dev/ttyS1. Many other possibilities exist to reprogram the AT89C52 for other tasks and have it communicate with Linux. If you are using the modem that came with the Webpal, it now appears to Linux as /dev/ttyS2. This is a change from older kernels where it appeared at as /dev/ttyS1. Floppy. No one has tried it. Smart card slot. 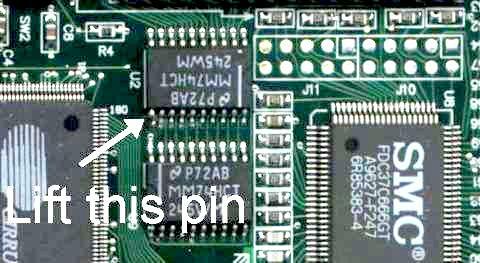 There is no code to support the smart card slot in the AT89C52 chip. That code would need to be written before the smart card slot could be used. The code could communicate via the second serial port (shared with the IR keyboard data) to Linux. justdave has an ftp site that contains some binaries and source packages for your root partition. aswx has a schematic and lot of info on the Wepbal hardware. tomw has a buildroot script. luban has a 64K DRAM modification.